This was the premium wine display in the silent auction area. Once the wines were sold out, the activity was over. 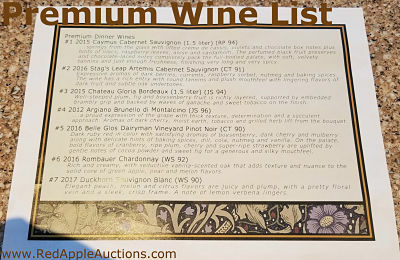 Wine is a commonly included item at many fundraising auctions. It’s used to bring in money via games such as wine pulls and ring toss games. It’s sold as complete packages in silent auction and live auction lots. Bottles are often added to other packages to enhance them. 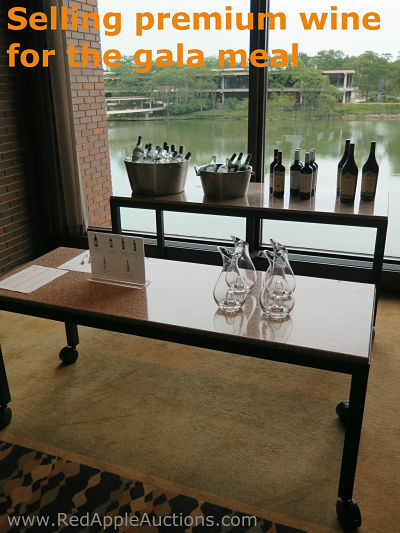 Select wine tastings can be offered to sponsors as a benefit. And — the focus of this article — wine upgrades can also be sold outright as a money-making activity. Selling better wine to be served at one’s table with the meal is an attractive offering to those who appreciate high quality vino. Not all venues or jurisdictions may allow you to do this, but it’s a good add-on for appropriate galas. Seven wines were offered: 2015 Caymus Cabernet Sauvignon, 2016 Stag’s Leap Artemis Cabernet Sauvignon, 2015 Chateau Gloria Bordeaux, 2012 Argiano Brunello di Montalcino, 2016 Belle Glos Dairyman Vineyard Pinot Noir, 2016 Rombauer Chardonnay, and 2017 Duckhorn Sauvignon Blanc. Some premium wine is donated. Other bottles are purchased and sold for double the price. Your crowd will dictate the quality and price of wines sold. The premium wine list on the right generated just under $5200 for the charity. They sold these bottles as the upgraded wine. There are more reds than whites offered. A similar format follows for each wine: Vintage, name, non-standard sizes, and rating followed by a description of the wine style. Do you have a wealthier crowd that loves fine wines? Check your venue and local laws. If there are no red flags, give it a try.